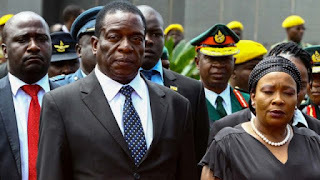 Zimbabwe’s sacked vice president Emmerson Mnangagwa said Wednesday he had fled the country as he issued a direct challenge to long-ruling President Robert Mugabe and his wife Grace. The ruling ZANU-PF “is not personal property of you and your wife to do as you please,” Mnangagwa said in an angry five-page statement, vowing he would return to Zimbabwe to lead party members. “This is now a party controlled by undisciplined, egotistical and self-serving minnows who derive their power not from the people and party but from only two individuals in the form of the First Family,” he said. Mnangagwa was the leading contender to succeed Mugabe, 93, but his abrupt removal appeared to clear the way for the president’s wife Grace to take over as president. Mnangagwa had been one of the president’s closet allies since Mugabe took power in 1980 after leading the fight against British rule. He was sacked on Monday after a bitter clash with the president and his wife Grace, with Mugabe’s spokesman accusing him of “disloyalty, disrespect, deceitfulness and unreliability”. Mugabe, the world’s oldest head of state, is due to stand in elections again next year.